I never would have thought it, but Twitter has turned out to be my favorite social media outlet. It turns out that if you follow interesting people on there, then it’s really quite easy to find interesting material. I’ve come across fascinating articles and beautiful artwork I probably otherwise would never have found. Like this Memoir of a Stomach. Of course, I wanted to see for myself what the fuss was all about. And, in today’s age of information availability, was able to find a digitized copy online. How cool is that? If you’re like me, you’re scratching your head wondering what “scrofulous” means. The short definition is “a diseased or run-down appearance”. 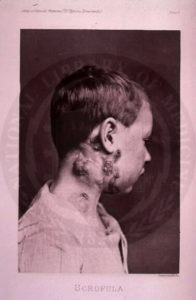 For the long definition, it takes us to the disease scrofula, also known as King’s evil, which is a disease affecting the lymph nodes, frequently caused by tuberculosis (called consumption back in the day). Essentially, the fairest skins belonged to diseased people. Wonderful. The rationale behind this is that impurities in the blood, which are normally expelled through the skin, are instead consumed by the disease, leaving the skin clear and unblemished. Thankfully, the book doesn’t advise contracting tuberculosis to look pretty. Instead, the author advises certain diets depending on one’s disposition. Are you lymphatic? Well then, you should be eating salads made from peppery greens, such as horseradish and mustard. This will stir your blood and clear the brain from unwanted humors. And stout people, well, they shouldn’t really be eating very much at all. The author goes on to share her own experience, when she was recovering from nervous prostration, found her appetite had gone. She didn’t force herself to eat, but instead happily ate what would barely be enough for an aged rabbit, and encourages others to eat only as much as will keep up the strength, citing her own diet as an example. What was the diet? I’m glad you asked. Breakfast, when eaten at all, was a small saucer of strawberries and one graham cracker. Lunch was half an orange (“for the burden of eating the other half was not to be thought of”). Followed by a “plentiful dinner” of a handful of cherries. Once a week she might indulge in some beef or soup. This was, allegedly, combined with walking two miles every day. Given that women’s clothing weighed around 17kg (37 lbs) by the end of the 1800s, I have a hard time believing a word of this. I took the liberty of putting this “diet” into a calorie calculator, and it comes to about 230 calories a day. And that’s overestimating on the fruit, because it’s hard to know how much a “handful” really is. If I were hauling 17 kilos of clothing while walking two miles a day, and eating only 230 calories worth of food… Oh man, I and others around me would not be happy. Luckily, there were other options for clearing up one’s complexion other than starving oneself or contracting a disease. There were various concoctions one could mix up to help whiten and soften the skin. One suggested mixture consisted of myrrh, honey, yellow wax, and rose water, all mixed together over boiling water. I find the wax ingredient interesting, as it makes me think it was used as a mask (as in, let it harden on the skin and then peel off), but the book doesn’t clarify whether or not this was the case. Tar and oil was another remedy. Tar, in this case, refers to spruce tree resin. Mixed together with olive or almond oil, it was to be applied to one’s face prior to bed, taking care to apply soft cloth to one’s face so as not to muss one’s bed sheets. After several applications of this, the skin is supposed to become “soft, moist, and tinted like a baby’s”. And applying more than one application was apparently important. Because after one application, one’s skin could potentially become a pimply mess, as the tar was believed to extract the impurities from one’s blood. Which, if you didn’t pay attention to the, uh, cleanliness of your blood (I feel like we’re approaching unsavory territory here), then your blood was probably in dire need of cleansing. And, yes, blood cleansing was apparently a thing. It was done through diet (as mentioned earlier), or with chemicals, such as carbonate of ammonia or powdered charcoal. The recommended solution was: take a teaspoonful of powdered charcoal mixed in water or honey for three nights. Then use a purgative to expel it from the body. This step was very important, otherwise the charcoal would remain in the body as “a mass of festering poison”. This woman really knew how to sell it. But apparently this would cleanse the blood like nobody’s business. One quarter spoonful of ammonia mixed in water was recommended for gastric upset, which was associated with various skin irritations, particularly among blondes. Or, you could just bathe in some ammonia. A gill of ammonia (about 150 milliliters or 5 fluid ounces) was to be mixed with a pail of water, so I’m guessing it was more a sponge bath type thing. This apparently was invigorating to the constitution, equated with a trip to the seaside in its effectiveness, as well as being good for the complexion. I could go on. There are so many odd little bits of information. Like the suggestion to flick soap suds into one’s eyes in order to make them shine. If you didn’t, you know, die, you could expect cleaner blood, a clearer complexion, a remedy for neuralgia, and rejuvenated hair. 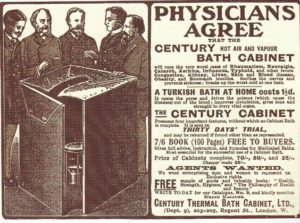 It is, however, recommended in the book not to try this at home, but rather go to a proper bathing facility that would offer such services. Anecdotal evidence is given of a woman who tried to take a sulfur-vapor bath at home, and ended up singing her hair and eyebrows, and nearly died from inhaling the fumes. She also ruined her complexion. Delightful! Those Victorians were pretty wacky. Like ingesting tapeworms to maintain a svelte figure. Eeww! Some of these tips are still in use, like ingesting activated charcoal to rid the body of poison. The fact she recommends a purgative seems unnecessary, but maybe her prescribe dosage was insufficient for compulsory expulsion. Sulfur baths are still a thing. People used to die often sitting in the hot springs back home. And I thing the Calistoga hot springs are still in operation. I was wondering about the charcoal thing, as it’s used to purify water, and you’re right about taking it for poison. I’d forgotten about that. A quick Google search shows that doing a charcoal detox is, in fact still a thing, though it’s not recommended. It can have various unpleasant side effects, like vomiting, constipation/diarrhea, and can mess with your electrolyte balance. So she might have been onto something suggesting a purgative. I had no idea people died in the hot springs at home! The bathing cabinets apparently also still exist, though I’m not sure how widely they’re used, and whether or not sulfur is still pumped in with the steam. They’re hilarious looking, though. Fascinating, Sara. Thanks for researching and writing this. Victorian-early 20th century is my era, so I enjoy learning what the inhabitants of the era were up to. Fun to read paired with your wit. Oh goodness, that’s some rabbit hole you fell into Sara – and I’m happy to explore the depths with you. Hmm, ammonia, sulphur, tar, 230-calorie diets – alas I’m afraid my blood is destined to remain unclean, my potential beauty hidden, and my dowry in a state of deep depreciation. The whole “system cleansing” is still hot today. People take shots of vinegar, or apple cider, or something else along those lines to clean the blood and keep the, ahem, pipes free of debris. Green tea should do wonders if taken daily, and let’s not forget about the various “detox” pills you can buy at your local pharmacy. Also, the cosmetic scene is crazy! It takes me 10 minutes to put on makeup for a night out, my 15-year-old has to put on 3 pounds of makeup at least 1 hour before we leave so it can “bake”. I kid you not, that is the technical term. This was a very intersting and entertaining post. The crazy things we come across on Twitter….. ? Yeah, detoxing is definitely still in. I saw a lot of things in this book that still seemed pretty relevant today. People in Victorian times did have bizarre ideas. It makes for interesting reading though. I have a Twitter account but I don’t really use it that much. Maybe I should see about using Twitter more. I do love me some Victorian bizarre-ness. 😉 For Twitter, I find it incredibly useful (that is to say, essential) to have lists based on the types of content being shared–say nature photos or quotes. That way, you can actually find stuff, rather than sifting through a great big pile of randomness.